Accurately cut wood and laminate flooring with these flooring saws. These tools have a circular saw that is mounted on a table and moves along guide rails to make precise cross cuts. 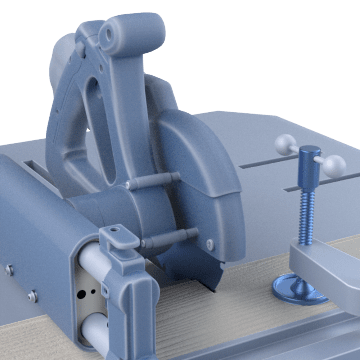 The tool's adjustable fence can be angled for making miter cuts, and the saw can be locked in place on the rail for making long rip cuts. The table base supports the workpiece without requiring additional support, and an integrated dust collection port and bag help contain airborne particles.